You must be a member of the Madrid Russian Language&Culture Group to attend this activity. Would you like to join this group? Dear friends, дорогие друзья: wish you all still a very good Protected content hopefully we’ll meet also this year again with old and new friends interested in Russian Culture (&language, but it’s not a must to know the Russian language). 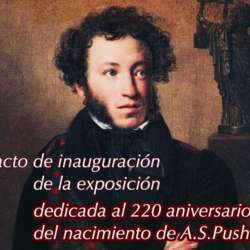 For our first activity I would like to invite you to the official opening event of the special exhibition dedicated to the Protected content of the Russian poet, dramaturge and novelist, A.S. Pushkin. The exhibition is organized by the Centro Ruso together with the Pushkin State Museum (Moscow). His director, E. Bogatyriev will be present at the official opening. "Дорогие друзья! Приглашаем вас на торжественное открытие выставки, посвящённой Protected content со дня рождения великого русского поэта, драматурга и писателя А.С.Пушкина. Открытие выставки состоится 30 января в 19:00 в Российском Центре Науки и Культуры (ул.Алкала, 61, 5 этаж) с участием директора Государственного Музея им. А.С.Пушкина, заслуженного работника культуры и Лаурета Государственной премии РФ - Е.А.Богатырёва." (Centro Ruso de Cultura y Ciencia). After this activity, you are all very well invited to continue the evening at a second exhibition opening with cóctel at a nearby art gallery in Salamanca Barrio!